My mom used to make a kind of cole slaw that had sliced up green olives in it and mayonnaise as dressing. I loved that combination as a child, salty and crunchy. Sauteing it with black olives and capers added, however, never naturally occurred to me, probably because no one in my family hailed from Italy where this combination is a good deal more common. The recipe below produces a warm dish with the sour zip of vinegar, a bit of sweet with a dash of sugar, and the salty savoriness of the olives and capers. Black olives, preferably Kalamata style, are the way to go. Try to avoid the terrible little canned ones that are flavorless and all one color, too commonly dumped all over pizzas, into subs and on top of Tex-Mex refried bean dips. If you don’t have kalamatas, or don’t like them, by all means try this recipe with green olives instead. Capers, crushed just a little before adding them to the cooked cabbage, provide a different salty, tangy aroma. Do you know the trick for taking pits out of olives? Put them on a cutting board and smack them flat with the wide blade of a knife, and pinch the pit out. Or better yet, buy pitted olives so you can toss them into salads, sauces or your mouth whenever you feel like it. The cabbage I had was a medium-large one, probably three pounds or so, and I shredded about a quarter of it, enough to make about four cups, which I think is enough for four servings. I cooked the cabbage until it was wilted and still had crunch. You might prefer a softer, well-done cabbage. After you have made this recipe at least once, discard the printed recipe and cook this dish according to your preferences, using red cabbage instead of green, more or fewer olives and capers, more or less oil, balsamic vinegar instead of cider vinegar and sugar, added onion or garlic. 1. In a large sauté pan, heat the oil over medium heat until it shimmers. 2. Add the cabbage, water, vinegar and sugar, and stir until the oil is pretty well distributed over the cabbage. 3. Put a lid on the pan, reduce the heat slightly, and cook the cabbage for about 5 minutes or until wilted. 4. 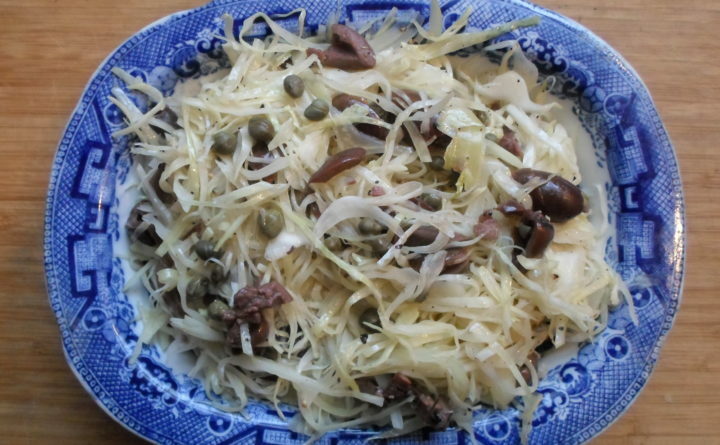 Add the olives and capers, and mix them and the cabbage together using a fork or tongs until the olives and capers are well distributed. Cook uncovered for about 5 minutes more or longer stirring once until the cabbage is as tender as you prefer. 5. Taste and season with black pepper, as desired.